Sony 50mm f/1.8 DT AF Lens SAL50F18. - Smooth Autofocus Motor (SAM). Autofocus: Yes. Focal Length: 50mm. In case of below conditions. Tripod Collar: No. In Holding in your local custom. Magnification: 0.20x. DT 50mm F1.8 SAM is a compact, lightweight, high-quality lens with a 50mm focal length (35mm format camera equivalent: 75mm) that is ideal for portraits and general-purpose photography. It is designed exclusively for use with a digital SLRs incorporating an APS-C type image sensor. Compact and weighing only 170g (approx. ), the DT 50mm F1.8 SAM reduces the need to carry heavy gear when shooting, yet offers crisp, natural imaging that is ideal for everything from portraits to scenic photos and snapshots. It also boasts a large, bright F1.8 maximum aperture and a circular aperture mechanism for smooth background defocusing. Distinguished by ultra-sharp imaging across the focal plane, the DT 50mm F1.8 SAM also features a minimum focusing distance of 0.34m and a maximum magnification ratio of 0.2. In addition, a developed Smooth Autofocus Motor (SAM) is used to drive the focusing lens group. item 7 Sony SAL 50mm f/1.8 DT SAM OSS Lens With Caps Great Condition!! 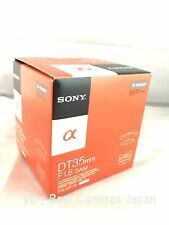 -Sony SAL 50mm f/1.8 DT SAM OSS Lens With Caps Great Condition!! This was delivered in great condition and looks brand new and takes great shots. I've only had time to take a few photo's with it and I want to use it for my macro shots as it is a fixed focal length. I have read that the fixed focal length lenses take a sharper photo, we shall see how well it does compared to my 18 - 55mm lens that came with my Sony A57 camera. As of now the lens works great and has taken some sharp photo's. I'll be back with some pictures to show my results. Great seller, sony niffty 50 1.8 was a steal. very nice lens, extremely versatile. not meant for filming it has an extremely loud AF motor in it. if you do use it to film then you might need an external mic or a camera that has in body AF motors in it. very quick shipping very good packing to keep the lens safe, the box was mutilated by the post folks but the lens was unharmed. it shipped with a rear lens cover but not a front one, it did have a 49mm minolta uv filter on it for protection. i would have preferred the hard plastic lens cap to this. over all this was a wise purchase. Great for what it's designed to do! I purchased this for portrait work and I was not disappointed. At f4 it's sharpness is spectacular! It's also great for low-light use. One thing I will say is that knowing what I know now I would have wanted a longer focal range for portraits. 85-200mm lenses can produce even more pleasing bokeh. On a crop sensor body this will still produce great out of focus backgrounds especially for head shots. You really can't go wrong with a nifty fifty for quality optics at an affordable price! Truly excellent lens that every Sony shooter should have in their bag!